Kenny Smith is the Cam Newton of the Internet. Strike a pose, Cameron Newton. 24-17 and Auburn is the lone SEC team still undefeated. This is the Twitter feed during the LSU-Auburn game. Because Twitter will drop these comments eventually, and brilliant play and wry observations should be remembered forever. Pictures are included, as are after-the-fact thoughts included in bold. One tailgating party has a musician playing the Van Helsing song from Forgetting Sarah Marshall. It is really good. At the RBD library they are playing Brickhouse. If you walk up those steps on the side of the parking deck and just as you reach the landing you here the baseline kick in you may count yourself as having a good day. You might then knock over a Direct TV dish, as I did. And then apologize to the people who’s tailgate you’ve just disturbed. They were nice people. 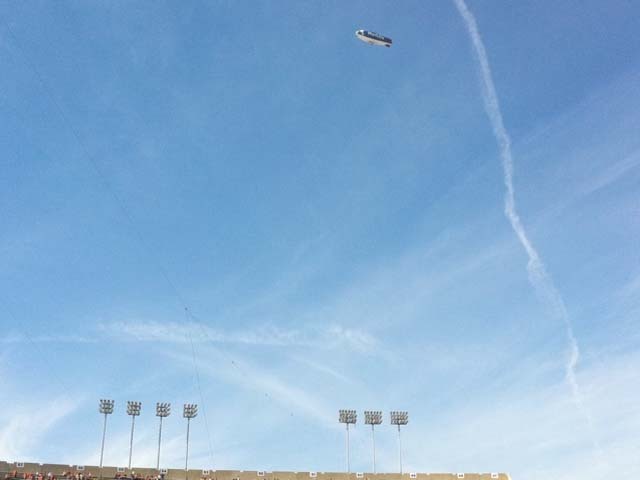 Another day, another blimp. I also counted a light wing plane, a helicopter, two small hawks and a yellow butterfly. 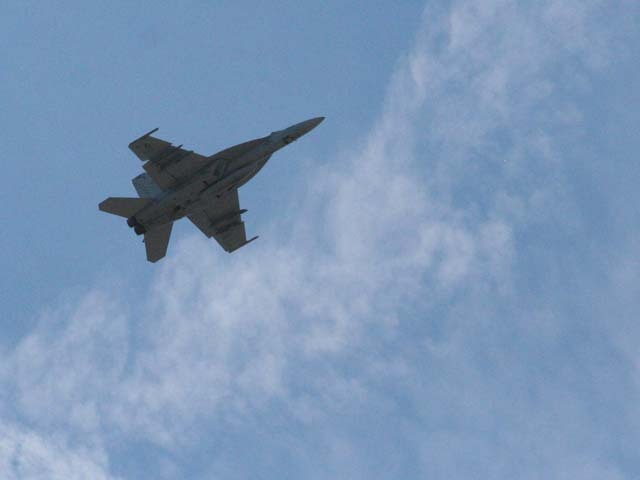 And also Nova, who flew right overhead. I’ve got great pictures in the photo gallery. Fighter planes overhead, a tank under center. Let’s play! No better place than Jordan-Hare Stadium today! @Z_Etheridge4‘s third down interception return to midfield sets the tone. @cameronnewton laughs at your idea of broken plays. Let’s review: Terrell Zachery, Mike Dyer, Cam Newton. TOUCHDOWN AUBURN 7-0. What do Cam Newton and Heisman trophy winner Pat Sullivan have in common? They’ve scored the same amount of TDs in one season. And of course Newton would have that bit of poetry later in the game, and still four more games. Sullivan’s record stood for four decades. How old will we be when someone breaks Newton’s eventual number? Lucky there wasn’t an unfair decapitation of the quarterback penalty there. How did he get up from that? Lucky, too, there was no roughing the quarterback penalty on that deadball dead lift and body slam. I suppose you could argue no one heard the whistle, but everyone else on the field stopped and I heard the referee blow it dead from the stands. Dodged a bullet there. 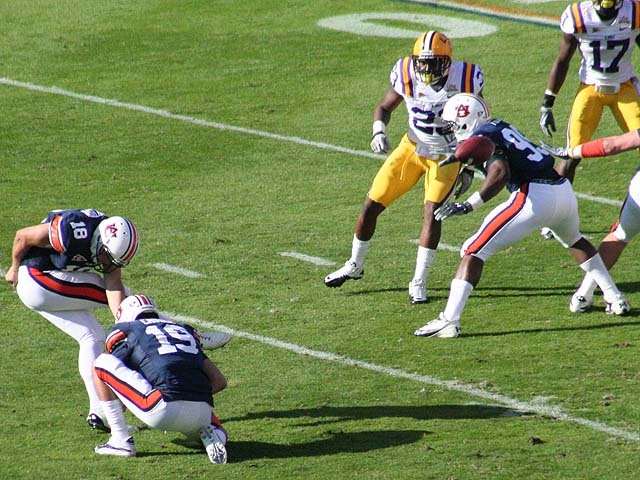 Auburn’s defense holds, LSU settles for a figgie. 7-3. Just so you know, there are a couple of Superman shirts in the north end zone, to which Auburn is now driving. @wesbyrum boots a field goal. He is now Auburn’s all time leading scorer. 10-7. Or 10-3. Accurate and it sounds better. Pardon me, we’re in the section of the stadium that goes delirious for field goals. Finally get a kickoff out of the back of the end zone … and have to re-kick. Penalties still must be a concern, this just being one more example of something that a championship caliber team needs to cure. This resulted in a net of 16-yard gain for the Bengal Tigers. They’d drive to midfield and then punt, starting that sequence of drives Auburn began at the goalline. A competent offense takes advantage of this 16 yard gift. 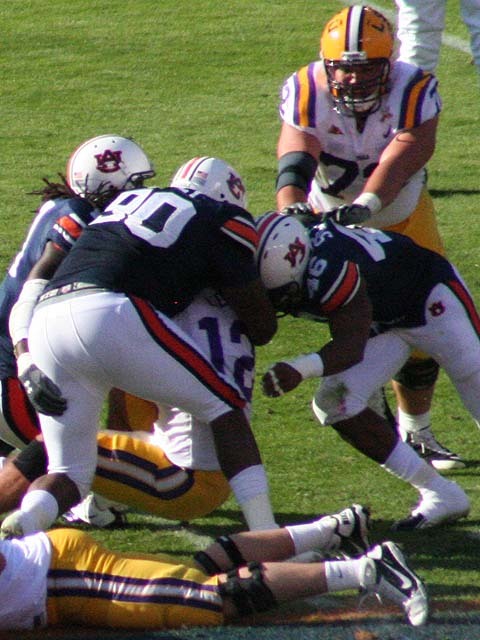 Nick Fairley does not like Cajun food. He does like bayou quarterbacks. 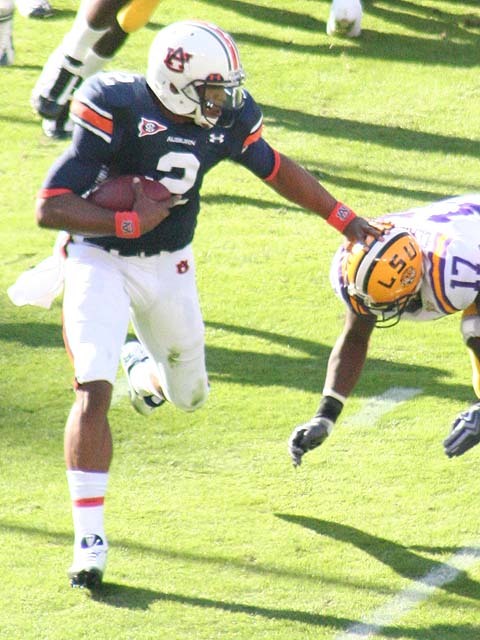 @CameronNewton would run for class president, but he is too busy running through LSU. @supurmario27 also makes it look easy. 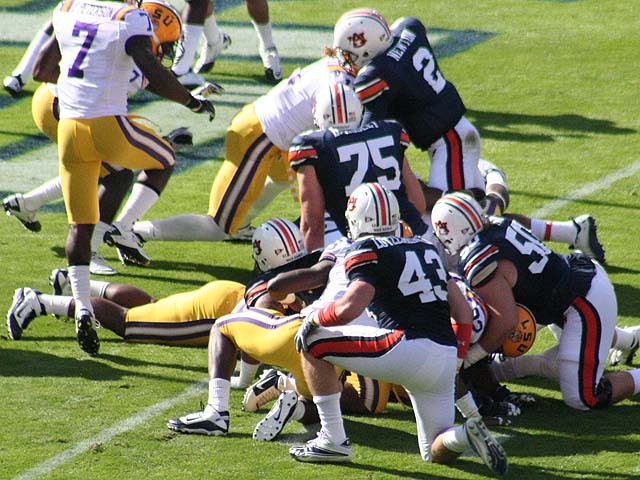 Auburn, from their own 1, slices through a generous LSU defense, but the field goal try is missed left. Do not make Nick Fairley mad. He will only haunt your daydreams, too. “Hi. There’s no one within 10 yards of me, I don’t need this football.” How many of these gifts will the Auburn team (generally) and the secondary (specifically) get this year? How deep does this karma cache go? The Miles Quatum Singularity: four minute drives last three days, and refs stop the game clock for reasons they can’t explain. 10-10 at the half. This game should be SO much different. Corollary: it will be in the second half. Mike Dyer is a cannonball. Darvin Adams is, in fact, smooth. @cameronnewton is coming to Baton Rouge to walk old ladies across the street. He will score many touchdowns in the process. @cameronnewton runs 50 yards for a score, runs upstairs to review the play and back to the field to call it a touchdown. Should have sent a poet. Little known ref fact: side judges are Bama fans. Not a conspiracy theory, but fact. He waved and we saw the colors peep through his uniform. Best not to talk about the fumble. The only team that can beat Auburn’s offense is Auburn’s offense. Fear the LSU kick team. Everything else appears manageable. Aubie had a Trojan horse contraption. Mike the Tiger tore the head off. Ahh, the pageantry of football. Worst spot of the game. The ref’s stripes are purple and gold. This being the Kodi Burns forward progress abomination. The fair reaction: this is the an unintended consequence of better camera angles and, ultimately, the huge network deals the SEC has signed. Everyone sees the officiating. Officiating has always been hit or miss, of course, but it isn’t improving as the game gets faster. There have always been calls made and others missed. Now every play can be closely scrutinized, even as unfair as that criticism of officials may (or may not) be. The unfair reaction: is that guy from Louisiana? The fans are wishing the officials a booooootiful Halloween. 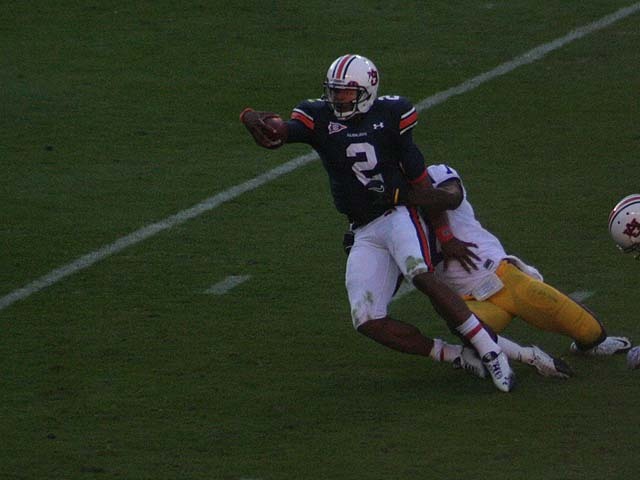 Someone text the Auburn coaches and tell them Lee can’t throw on the run. 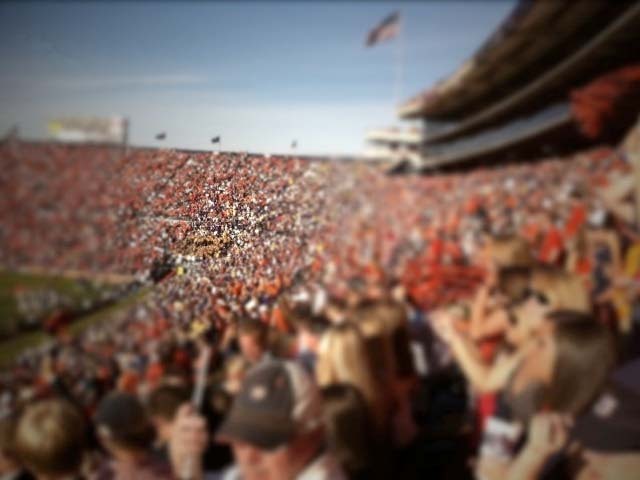 A hasty tilt-shift shot of the crowd at Jordan-Hare. @cameronnewton is not an Ent, but he did inspire Tolkien. Mike Dyer also plays rugby. And we start the fourth quarter feeling in control, but Les Miles is eating chlorox pellets. There is no control. Auburn has 364 total yards through three quarters. 278 of them on the ground. LSU has 192 total yards. Les Miles strikes with his first bout of successful irrationality. Let us hope it is not diarrheal. 17-17. Third and long? Run a draw! This game now enters Bizzaroland, population: the SEC. Les Miles, mayor. @wisematize In a moment I’ll tell you we were just doing what we do. Whatever that is this week. 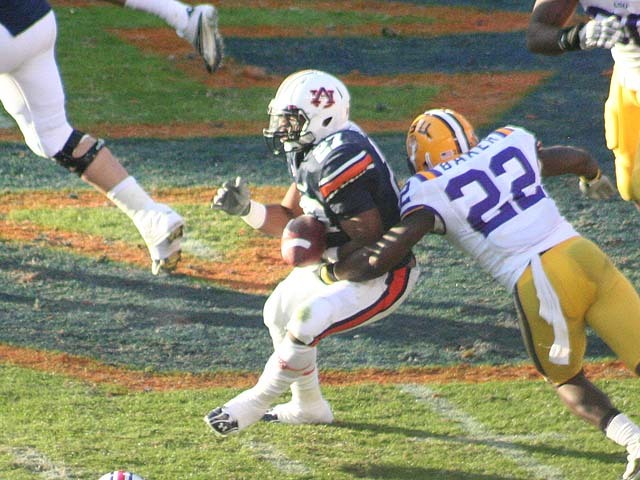 Nick Fairley dislikes the color yellow. He thinks you look stupid in purple, too. TOUCHDOWN AUBURN! Onterio McCalebb! 70 yards! 24-17! Auburn over 500 yards of offense tonight so far, the fourth SEC game in a row the Tigers have done that. Never before. Savor it, because it can’t last forever. A few more years isn’t too much to ask, is it Gus? 6:10 left on the clock. Just to counteract Les Miles Auburn needs a 6:35 drive. This place is the thunder dome. This is a fourth quarter defense, designed to wear you down early and tear out your heart late. If @cameronnewton doesn’t win the Heisman the Eufaula Tribune will give him the inaugural Camsman Trophy. Eight and OH! Auburn sits all alone atop the SEC the Tigers get ready for Ole Miss. 24-17. On to vict’ry! I believe in Auburn (and it has nothing to do with football). Gene Chizik just leaped the rail to get to the student body. And the Heisman chants are echoing to the Downtown Athletic Club. It is remarkable how many people are lingering in Jordan-Hare Stadium. This post-game video on @AUHD is great. Gustav’s WIFE is all over the players’ twitters telling them to focus on the next game and to step up and be leaders. I watched the game with the group by the library parking deck, they were extremely nice. They gave me some whiskey for my hiccups. Also, whiskey does nothing to help hiccups. Adam – Noted, and thanks. Wes – Mrs. Malzahn seems like a very nice lady. She probably also wants the referees to get out of the way so the offense can go faster. Me too! I must be channeling Mrs. Malzahn….thought about texting the refs too, but figured if they can’t see, they can’t read..
Tigertracker — the inconsistency you see might actually be a rule properly administered. If an offense subs out players the defense must be given the opportunity to do so as well. Malzahn shuttles in two or three every few snaps it seems, and the defense has the right to adjust their personnel accordingly. Now, what is interesting in that context is that Malzahn said somewhere along the way last year that he’d like to have personnel groupings as such that he can run everything without subbing out players (and giving defense the chance to respond). 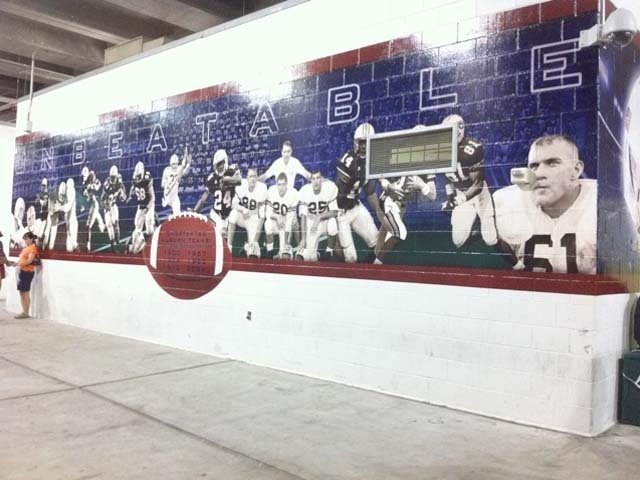 If that is possible, feasible and he sticks around long enough to do it at Auburn we might see War Eagle One go plaid. There have been times in the past, specifically last year, when referees were flummoxed with the absence of a 3-2 type pace and they actually hampered the offense’s speed. I’m not sure if we’ve seen anything particularly egregious like that this year thus far.